"My husband and I used to visit a Lebanese restaurant in DC and loved their dish called 'Loubieh Bel Zeit.' When we moved away we craved this dish, so I tried to re-create it and came up with the following recipe. My husband LOVES it and wants me to make it all of the time now." Heat olive oil in a skillet over high heat; cook and stir onion, garlic, and salt in the hot oil until onion is softened and browned, about 15 minutes. 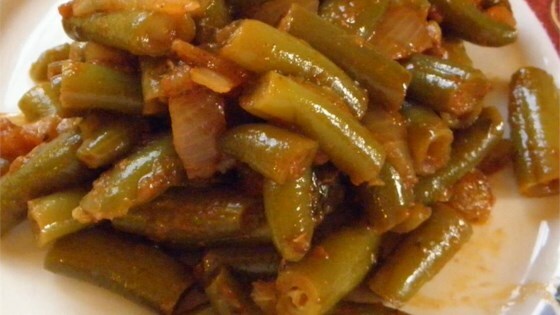 Mix tomatoes and green beans into onion mixture. Add sugar and cinnamon to mixture; bring to a boil, lower heat to medium-low, cover, and simmer until green beans are tender, 20 to 25 minutes. Time to prep may take longer if you buy beans that haven't been cleaned yet. I used canned green beans. I wasn't thrilled with the recipe to be honest. I liked it, Mom ate it, and hubby said ehhh. I liked the cinnamon in the mix. Not often but I will make this again.